Book Details: Reference & historical book on Sharps model identification. Listed models of Sharps 1851 carbine, Sharps 1852 carbine, Sharps 1853 carbine, Sharps 1855 carbine, Sharps 1859 Carbine and Sharps 1863 carbine. 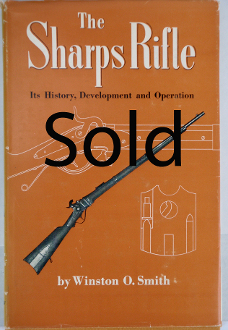 Also referenced is Sharps New Model 1859 percussion rifle, and Sharps Officer’s model or Pistol-rifle. Many other models such as Sharps New Military rifle, Sharps 1878 carbine and rifle, Sharps Long Range rifle model 1878, and Sharps Mid-Range model 1878 rifle. The dust cover shows a lot of wear, with dents, edge curling, tearing, and handling marks. Book itself in good condition with some edge wear on bottom near binding, my guess is some shelf wear. Hard cover measures about 6 ½” x 9 ½”.